Eagles Rebound to Top Temple 45-35 | BANG. 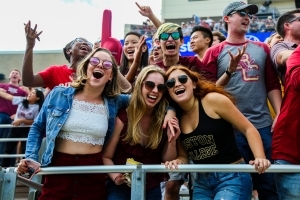 In his first matchup against his former team, coach Steve Addazio witnessed Boston College defeat Temple 45-35 Saturday afternoon. Although the Eagles rebounded after last week’s dreadful performance, Temple proved to be a tougher challenge than most predicted. The Eagles started strong on their first drive, with Anthony Brown leading the team on a productive 12 play drive. After the Eagles were forced to fourth and 15, it looked as if the Owls had stalled BC’s offense. However, Anthony Brown connected with wide receiver Kobay White on a 17-yard reception to get the chains moving. The drive would end with a 7-yard touchdown pass to Tommy Sweeney with 8:16 left to go in the first quarter. Temple responded quickly, as their running back Ryquell Armstead ripped out a 75-yard touchdown run to tie up the game 7-7. This was the second week in a row the Eagles’ defense allowed a big play of over 70 yards. 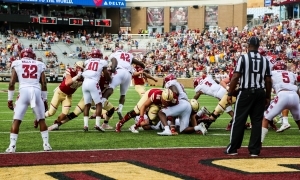 On the ensuing kick off, BC’s turnover prone special team fumbled the football, resulting in a 17-yard touchdown return for the Owls. The Eagles’ main return man Michael Walker has gone back and forth between boom and bust plays on returns–while he averages a respectable 30 yards per return, he has also fumbled twice in the past three weeks. With 4:25 left to go in the first half, AJ Dillon jump started the Eagles offense, ripping off a 55-yard touchdown run to tie the game 21-21. 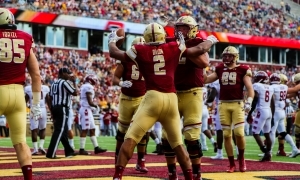 Following Dillon’s big play, BC’s defensive back Taj-Amir Torres came up with a huge interception. The Eagles would expand their lead to 10 after big plays from players on both sides of the ball, ending the first half with a 31-21 lead. Towards the end of the first half, Dillon came out of the game with an apparent ankle injury, which kept him sidelined for the rest of the day. Dillon ended the day with 160 yards and 2 touchdowns in just one half of play. Thankfully for the Eagles, backup running back Ben Glines came in and kept the offense rolling for BC. Glines finished the game with 120 yards and 1 touchdown. The Eagles scored their first touchdown of the second half using the notorious Philly Special against the Philadelphia-based team. 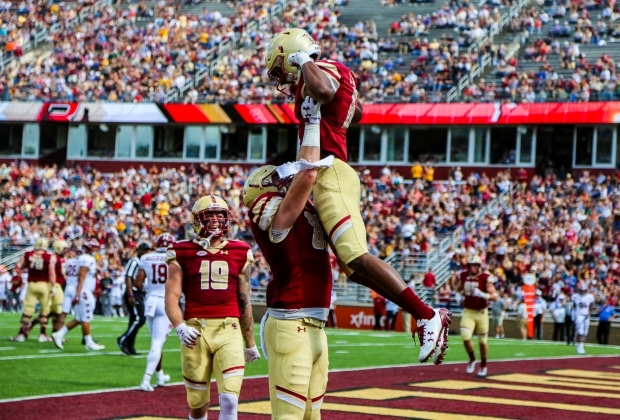 Wide receiver Jeff Smith threw a nine-yard touchdown pass to quarterback Anthony Brown, thus extending BC’s lead to 38-21. BC bent but didn’t break as the Owls continued to get strong play from Armstead. BC’s lead shrunk to 38-35 with nine minutes to go in the fourth. Armstead ended the day with four touchdowns and 171 yards. 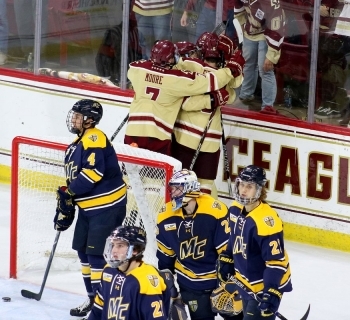 The Eagles’ defense came up big, forcing two back to back four-and-outs to end the game. Temple QB Anthony Russo struggled all day against BC, completing just 44% of his passes and throwing two interceptions. BC defensive leader Zach Allen was a force in the backfield, ending the game with four tackles for a loss and two sacks. After this win, the Eagles improved to 4-1, their best start in the Steve Addazio Era. 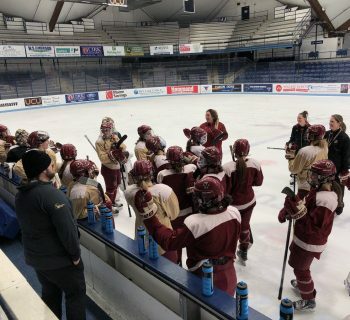 BC hits the road next week to battle ACC opponent NC State on October 6, with the hope of gaining another ACC win.